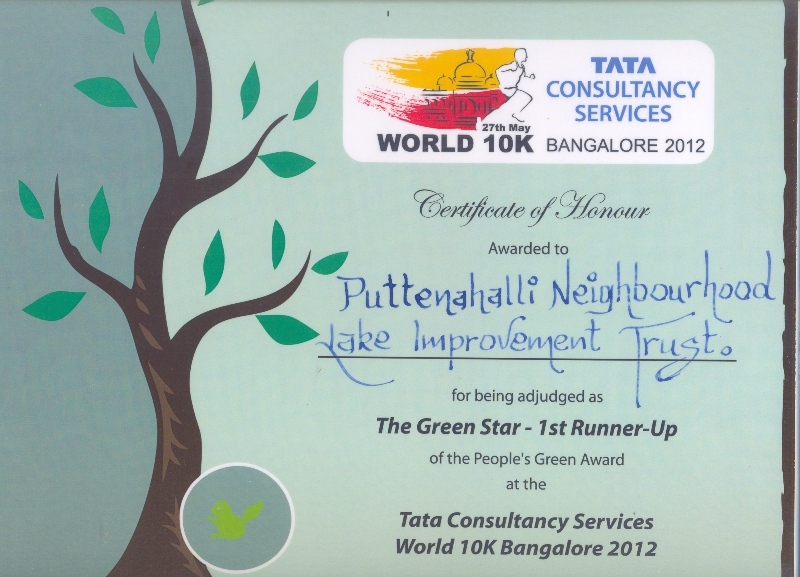 PNLIT has been adjudged the Green Star 1st Runner-Up of the People’s Green Award at the TCS World 10K Bangalore 2012! The winners were announced at a crowded press conference at ITC Windsor Manor last evening. Prasanna, Usha and Nupur received the award from Kannada actor Mr. Puneet Rajkumar and Mr. Atul Ballal of ITC Windsor Manor. 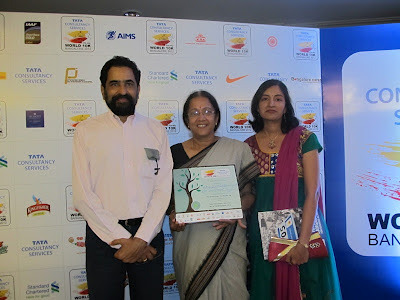 The TCS World 10K which was held on 27th May had launched the People’s Green Awards as "a platform to admire and acknowledge people who share this dream to make earth greener and better place to live in." The nominations were in two categories ‘Green Star’ – Not for profit green initiatives by individuals, groups/ NGOs and ‘Corporate Green Star’ – for companies and corporate foundations taking green initiatives. See the press release here. Winners were selected on the basis of public voting (30% weightage) and the Jury (70%). The eminent Jury of the Peoples’ Green Award which comprised Mr. Karan Bhalla (WWF-COO), Mr. Hem Pande (Joint Secretary, MOEF), Dr. Anil Kumar Dikshit (IIT Bombay), Prof Damodaran (Prof IIM – Bangalore) and Mr. Vivek B Singh (Joint Managing Director, Procam International) screened the final five to judge the winner. The 2nd Runner-Up prize of Rs. 25,000 went to MSI – Malleswaram Swabhimana Initiative, an RWA founded over a decade ago, has been working towards making Malleswaram a zero garbage locality by creating awareness about waste segregation at source. The Grand prize of Rs. 75,000 to Samarthanam’s Parisara which aims to provide end-to-end waste management solutions for the corporate organizations. First Runner-Up prize of Rs.50,000 was awarded to PNLIT, our local citizens’ initiative to restore and maintain Puttenahalli Lake with public participation. Though PNLIT is only two years old we have managed to save the lake and more importantly, become a model for other resident groups in the city. Our success would not have been possible without support from you, residents in the area. A big, big thanks to all. We look forward to your continued support.